(CBS/AP) Chris Brown reportedly tweeted a picture of himself with a gash on his chin, an injury he claims he sustained from a clash with rapper Drake's crew in a New York City nightclub. New York City police are now investigating the bar brawl between the two hip hop stars. Police say five people were injured in the fight at club W.I.P. early Thursday morning, where people from both entourages were tossing bottles. Police say the injuries were mostly minor lacerations. It's not clear what prompted the fight. 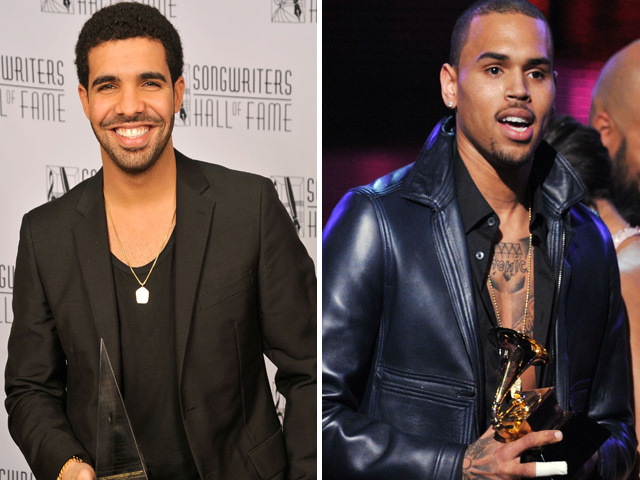 Both Brown and Drake dated singer Rihanna, but Brown remains on supervised probation for beating her in 2009. Rihanna performed on Drake's hit, "Take Care." Brown tweeted a photo of himself with a cut chin, then later removed it, as well as other messages about the fight. A representative for Drake issued a statement denying that the rapper was involved. "Drake did not participate in any wrongdoing of any kind last night at W.i.P. He was on his way out of the club when the altercation began," said the rep, reports TMZ. "[Drake] did not engage in any activity which resulted in injury to person or damage to property."